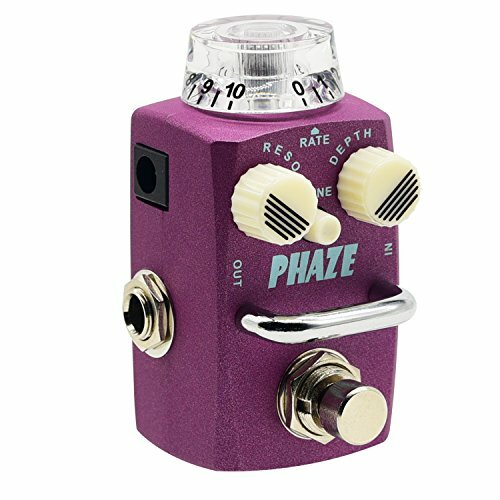 Hotone Skyline PHAZE is a dual-mode, analog phaser pedal stompbox, bringing back that iconic 70's warm, subtle and one-knob phasing sound, adding another sonic dimension to your guitar sound. The normal mode (SHINE button off) gives you that classic, warm, natural phaser sound coming out of that one-knob orange box, which has dominated the industry for decades; SHINE mode can add some additional brightness and shimmer to your tone. You can use the RESO, DEPTH and RATE knobs to create your own phasing sound-from subtle nuances to twisted textures, further expanding your tone for both rhythm and lead. Normal mode (SHINE button off) gives you that classic, warm, natural phaser sound coming out of that one-knob orange box, which has dominated the industry for decades; SHINE mode can add some additional brightness and shimmer to your tone. True-bypass keeps your guitar signal neat and uncolorated.